Fairey's multi-colored Obama gave visual definition to the intangible excitement stirred by the candidate, and soon that face was everywhere. In John Carpenter's They Live, Rowdy Roddy Piper, a former pro wrestler playing an unemployed construction worker, discovers a pair of special sunglasses that reveal a secret totalitarian regime. Glasses on, Piper can see the skull-faced overlords at the levers of power and can decipher the subliminal messages printed on the world's billboards: OBEY. And that's how a wrestler began his tongue-in-cheek war against the establishment. "That movie had a big influence on me," says Shepard Fairey, the artist and graphic designer whose OBEY GIANT sticker and graffiti campaign began in 1989, two years after They Live was released. "They Live was campy and funny but had this oddly profound message, which is that people have no idea how manipulated they are. And that all you need is some glasses to see the truth just below the surface. And what he saw was this pervasive command: Obey. It's such a compelling word. When told what to do, my instinct is to do the opposite. With my art, I have always been interested in that kind of emotional response." Fairey's vehicle for that emotional response was André René Roussimoff, another former pro wrestler whose 7'4, 540-pound frame earned him the sobriquet Andre the Giant. "Intentionally, there was no message," Fairey says. "It was supposed to mimic advertising, but without a product." Fairey hoped Andre's visage would awaken people to the pervasive realm of real marketing around them. Content-less, Andre was meant as a mysterious muse, an invitation to search for meaning. This year, Fairey's has discovered a new muse: Barack Obama. You've probably seen the simple but effective poster by now. Stenciled in red, white, and blue, Obama has the distant, upward gaze of a visionary leader. Below him, the word: PROGRESS. "That was the original print," Fairey says. "Later, when the campaign commissioned an edition for fundraising, I changed it to their slogan, which was 'HOPE.'" Fairey is standing over a four-foot tall version of that painting in his expansive studio and gallery facility in Echo Park, near downtown Los Angeles. This is where Fairey and several rooms full of assistants use exactos and computers to manage Fairey's myriad art and design endeavors, including preparing for his first big retrospective next year at Boston ICA. In this room, a massive table is covered with hundreds of prints from over the years, showing the evolution from Obey to Obama. "I started getting into more explicit political statements in recent years," he says. In 2003, there were posters against the war, and in 2004 an anti-Bush campaign depicting the President as a smiling vampire. "Needless to say," Fairey says, as Obama's stenciled face stares up at us from the massive paper collage placard, "that election didn't turn out as we hoped." Like most of us, Fairey first took notice of Obama in 2004, after his rousing keynote address at the Democratic National Convention. "I saw it on TV, and I was really impressed," says Fairey. "What Obama said was unusually idealistic. These weren't the usual safe things politicians repeat endlessly." Even before Obama upset Clinton in the Iowa caucuses, setting him on an unlikely path to the nomination, Fairey felt moved to render Obama iconic. When Fairey met someone who worked in the Obama campaign, he made a back-channel inquiry for permission. To Fairey's surprise, word came back with a green light. "Our print run was before Super Tuesday, when California had its primary," Fairey says. "Within that first week, there were nearly 5,000 posters out." Fairey's multi-colored Obama gave visual definition to the intangible excitement stirred by the candidate, and soon that face was everywhere. 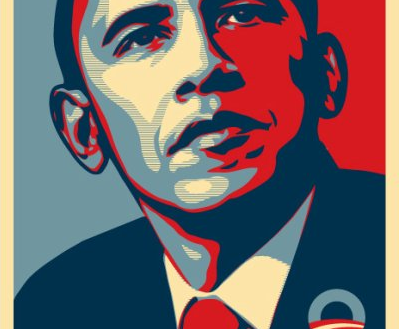 As with Obey, the Obama icon propagated itself. Fairey's free distributive model fit well with Obama's bottom-up, technologically-oriented, self-starting organization and base, and Fairey's web traffic spiked as thousands of people downloaded the image, applying it to their own sites and printed materials. A collaboration with a San Francisco street-wear brand called Upper Playground put the image on t-shirts. The Obama campaign commissioned 50,000 copies of an official poster, raising $350,000 for the campaign. Other artists followed suit, creating limited editions under the banner of Artists for Obama. "This was all very exciting. It went well beyond my usual audience." There's more! The rest of the article is here, on my blog.